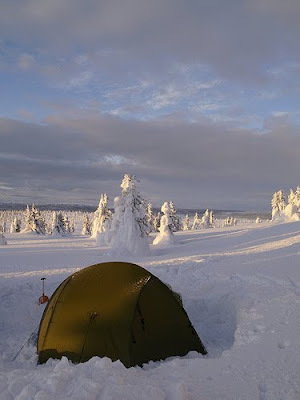 I’d been a concerned that a winter sleeping bag rated to -18C would be overkill for a night in a hut. That concern was misplaced. By the early hours the bunk room was cold. Certainly sub zero. By morning, the prospect of getting out of bed was just as unattractive as it would have been was I lying in a tent. As I lay building up the motivation to get up and set the fire, I heard somebody else, I guess Willem-Maarten, doing just that. The immediate future is suddenly a whole lot brighter. Just lie in a little longer then make a beeline for the stove. By the time I make an appearance the stove is warming the room nicely, there’s a kettle of hot water waiting for me and the others are up and about. By the measure of the weekend breakfast is a civilised affair. Still an adventure breakfast eaten out of a foil pack but now consumed sitting on a chair wearing few enough layers of clothing that I can bend my arms. My morning hot chocolate, a substitute for coffee, my having avowed that everything passing my lips this weekend will be bursting with calories, is drunk out of a proper, ceramic mug. The start is a relatively slow one. There’s not much to pack but we take our time about packing it. Then there’s cleaning and tidying to be done. We do all eventually manage to get out of the door and when we do we step into a crisp, brightly sunlit morning. The door locked behind me and the key safely stowed I step into my skis. Not without a pang of reluctance. When covering the last kilometres the previous day, when sweating up the long climb on the heels of Willem-Maarten, the thought that I was, at some point, going to have to ski back down the same slope kept doing rounds of my head. That moment was now upon me. Almost. First I have to navigate up the steep bank back to the track. As my first steps take me past Thim I sense, perhaps wrongly, the same reluctance in him. The next thing I sense is a light thud as I bury my head for the first time today. Not ten meters from the hut! The now familiar recovery routine, involving swearing and straining, sees me on my feet and, thankful that there was no audience of locals to cheer us off, I make my way up the hill. Then comes another thud. Muffled and distant, this thud is the sound of Thim taking a fall in exactly the same place. Getting to the track is not what I’d call straight forewords. Herringbone climbs and side-stepping are that much more difficult amongst the trees. I do, however, make the track without incident. In anticipation of my next fall, I wait at the trackside and let Willem-Maarten and Theo ski through. Better, I think, to allow them free passage. Then Thim and I once again find ourselves lining up for synchronised face-planting. Now, one lesson I have learnt in my chequered skiing career is you only need to think half a negative thought and the ski gods rub their hands in glee and pounce on you like rabid dogs. Visions of mistakes appear to be, invariably, self fulfilling. Armed with this valuable knowledge I try to put thoughts of impending disaster out of my mind. Hoping at the very least to bluff my way out of the situation. Feigning confidence I kick and glide to get some speed and, expecting a fast schuss, am surprised to find that my skis are running slower than the day before and that I have to actively kick and pole to keep forward momentum on all but the steepest sections. Perhaps because it’s colder today? Whatever the case, I make it to the first intersection, at the head of the lake without incident. So does Thim. The plan today is, rather than to go back the way we came, to first head further west, away from our destination and to make a big loop past the Grunnesvatnet and back through Svartsetra. We follow the now familiar narrow tracks, drawn by snow scooters, for the rest of the morning under blue skies and bright sunshine. We make just one soup and snack stop but the pace is nevertheless relaxed, the landscape captivating and the conditions as near to perfect as I can imagine. The sun is surprisingly powerful. As we travel we’re dealt close ups of sculpted snow, sugar frosted birch and picture postcard huts. Behind each of them, long vistas with big mountains as backdrop and a middle ground of smaller but prominent fells. Previous incarnations of this plan would have taken me to either high mountains just like those or these nearby fells but as I work my way across the relatively low lying and level terrain I’m convinced my skiing wouldn’t have been up to the task. As the track swings South-west away from the Grunnesvatnet we cross a junction with the Troll-Loype. A right turn here would take me north, onto increasingly higher ground and eventually into Rondane. In spite of my skiing ability I feel an urge to turn right. I can see myself having to keep my ambition in check in the not too distant future. In the early afternoon the sun is obscured by cloud and, as if stepping from an overheated shop into the cold street, the temperature appears to plummet. We find ourselves at the foot of a steep climb to Svartsetra, the steepest yet. 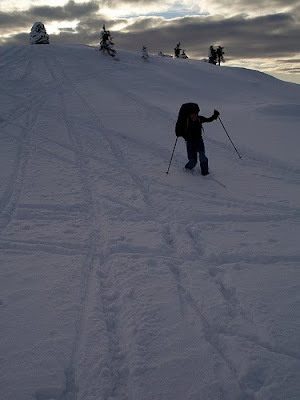 It’s hard work, made harder by the reluctance of my skis to bight home on the kick. Short steps with a deliberate firm placement of the kicking ski seam to help but the very steepest sections demand to be herringboned. As we reach Nysetra, I’m in a full-on sweat which all available venting and exposing my forearms has failed to suppress. I’m beginning to dip. Time for a break. Time to eat, drink and put on some insulation and burn some of the sweat out of my layers. We break amongst the huts of Svartsetra with most of the climb behind us but some still up ahead. To my eyes, the downhill looks fast and fierce and, regardless of the effort, I’m glad we’re going up rather than down. We make seats and settle down to eat. Today has been busier. We’ve seen five people since leaving Djupslia, and as we sit we see two more gliding down the hill towards us. A couple of meters uphill from where we’re sitting a nasty, steep-sided dip runs at right angles across the track. I watch with interest as the first of the two skiers, a man, hits the ditch at speed, corrects with a couple of quick dance steps and carries on down the slope. There then follows a surreal moment, visually pythonesque, complete with sound effects. The second skier, a woman, presumably the wife of the first skier, scoots down the hill at high speed gradually coming into sharper focus. She’s fully made up, wearing a bronze all-in-one insulated ski suit ( as I write this I wonder if this latter observation may be an unintentional mental embellishment but I really do remember it this way) and a long haired rat, no a small dog, yes a Yorkshire terrier or some such, is running hell for leather, all tongue and snot, ahead on a long lead tied to her waist. As the dog draws level with me the woman approaches the dip and my view of her is obstructed momentarily. Then comes an audible thud and a high pitched squeaking sound, a squeaking sound not unlike that made by a rubber duck if you jump on it with both feet (don’t ask me how I know this), and the dogs head jerks backwards violently as it comes to a sudden stop on a tight lead. I catch sight of Willem-Maarten and he’s wearing a broad grin. The woman has just nose dived into the ditch. Fantastic. Now I know this makes me guilty of schadenfreude in the first degree but this moment, to me, is a sweet one. Even without the surrealistic accents. Why? Because I’ve just witnessed a scandinavian crash and burn in the loipe. Not only that but this local performed the act in front of an audience of foreigners. I´ve waited years for this. Rested and refuelled we pack up and step into bindings. It occurs to me as we move off that we four are dressed in full armour, carrying big packs and sliding on wide skis equipped with Telemark bindings to travel through an area used by Norwegian women, in full make up, to exercise their Yorkshire terriers. Feeling a little overdressed I work to put the rest of the climb behind me. Just beyond Svartsetra we arrive at a junction. Literally and metaphorically. From here we can either bear left, run south-east for a couple of kilometres and rejoin the Steinsetra track or, alternatively, leave the track and make directly for Veslehaugen and the tents. In other words we can continue as we have done on prepared tracks or we can get into the landscape and break trail. The discussion is a short one. The skies are clear, we have plenty of daylight, the ground doesn't look difficult, there are just a couple of kilometers to cross on an easy bearing due south and the Steinsetra track running east to west across our path makes for an unmissable catchment feature. Willem-Maarten heads off first and does the lions share of the work. In my experience every trip has a defining moment. For me, this is the defining moment of this trip. 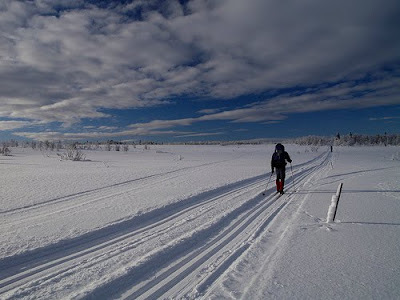 Skiing in the tracks across Oyer Fjellet is great fun and beats the very best of outdoor days in Holland hands down, but I still get a sense that I'm looking at the landscape from the road. From a safe distance rather than immersing myself in it. Not ten meters from the track I look back over my shoulder and the scar of the track has disappeared. All that remains is the landscape and I'm already immersed in it up to my neck. This is great. The whole trip suddenly falls into place. This is why I'm here. This is why, as a non skier I've worked to overcome my reluctance and strapped skis to my feet. Right now, my skis, instead of being an unnatural extension of my feet, all at once too long and to too slippery and out of control, are all of a sudden my best friends. 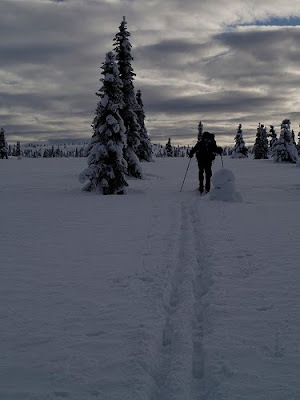 Skis are enabling me to cross wild country through impossibly deep snow and providing me with a stiff hit of wilderness experience. The choice to go with wide skis now makes perfect sense. The traverse, a gradual climb all the way, is just a couple of kilometres but I revel in every meter of it. I'm treated to views of the surrounding hills and distant mountains each across fields of virgin snow, twinkling under the fall of sunlight. The views are framed by the sparse coniferous wood through which our freshly cut trail weaves. The trees, half buried, now just pillars of snow, play peekaboo, hiding and revealing views in quick succession. As we climb, the view to our rear, to the North, the land of giants, steadily opens out and my progress is slowed by an ever more powerful compulsion to stop, turn around, and take it all in. I don't want this to end. My camera shutter runs hot. Too soon, the Steinseter track jumps across our path and were back in the world. We now have a second chance to choose between track and virgin snow. I urge Willem-Maarten to ignore the track and continue breaking trail. Although he's worked twice as hard as the rest he doesn't object and carries on. The top of Veslehaugen, familiar from the morning of the day before, is now clearly visible and we make a direct line for it. Just a few more minutes sees two of us at its foot and two of us at its summit. Theo and Willem-Maarten take the chance to play. Thim and I are happy to watch while they both telemark down the slope. Theo even manages to make a turn. Then we all glide down the easy slope to the tents and find them both still standing. By the time we step out of our skis it's mid afternoon. Still quite early with a couple of hours before the light fades. There follows an half hour of melting snow, boiling water, taking refreshments and improving the camp. 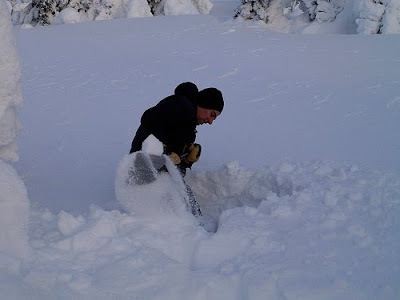 Theo Improves the camp by, graciously, levelling the snow under my half of the inner tent. Willem-Maarten and Thim improve the camp by building walls and in the process create man-traps in the walk ways. Everybody is just keeping busy. Doing anything to keep occupied and stay a little warmer. It's all too easy, when the last long day of a trip is drawing to a close, to switch to a different mindset. To let the trip become something of the past and to focus on packing up and going home. On any trip, especially one as short as this, it pays to fight that feeling. To treat every minute as part of the journey and only to start looking back when the bags are unpacked and the kids are opening their presents. Willem-Maarten fights harder than the rest. He starts digging a snow-hole, just for fun, but finds it impossible. The snow's not consolidated and, half a meter down, he hits the tops of small tress hidden by the snow. By the time he stops the golden hour has just started. 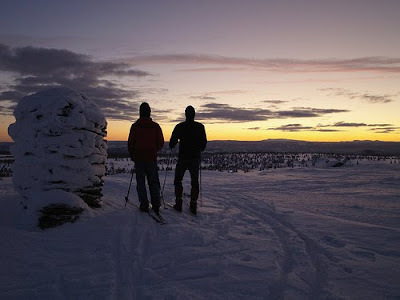 Without warning he announces a plan to climb Storhaugen and jumps into his skis. There follows a short discussion, Theo decides to join him but Thim prefers to head for the track and practice some downhills. I'm torn between options. Right now I´m busy with my camera, taking advantage of the ever changing and improving light but, as ever, uncomfortable about splitting the group, agree to go with Thim. A breath later, recalling the spirit lifting experience of leaving the track in the early afternoon, decide nevertheless to head for Storhaugen. Thim can´t be persuaded and heads down to the track. Willem-Maarten, like a dog in the gates, can´t be persuaded to wait and heads up the hill closely followed by Theo. I take my time, make sure I´ve got all I need, polariser, spare battery and the like, step into my skis, and happy to be alone for a while, head out at my own pace. There follows an hour that can only be described as magical. 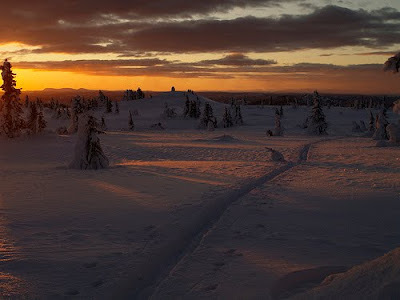 The going is easy, I just have to follow the tracks cut by the hares, and once the summit of Veslehaugen is passed, the prominent top of Storhaugen, is in plane view. I decide not to make the top my goal and instead to just see where the journey takes me. To take my time, take some photos, get as far as daylight allows and turn back when it´s time to turn back. It´s a good choice. Tortoise tactics are best suited to this race. As I move through the trees the sky begins to burn. A few scattered embers quickly spreading until the horizon is a single, continuous sheet of flame. The warmth of the sky is projected onto the cold snow under my skis. Bands of gold run out from between the trees and cross my path. The warm colours, strangely conspicuous and out of place in the winter landscape, warm the soul but leave noses and finger tips frozen. The scene, far from frozen, changes constantly. 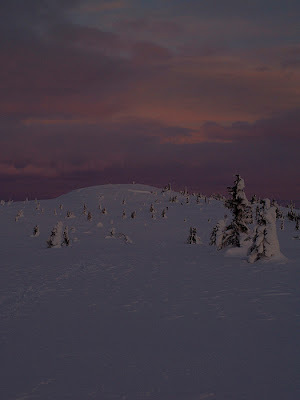 The colour deepens and the shadows lengthen turning subtle patterns in the snow into deep relief. The sun sinks quickly. It´s movement perceptible. The whole becoming two thirds and then a half until finally just a sliver is visible. I want to throw a noose around it and tie it off, delay the process, win some time. For a moment, there are two suns. Two bright orange partial spheres, noses against the earth, peering over the horizon and then they´re gone leaving light reflected from the cloud base to do all the work. It´s not just about light there´s sound too. At first an unbelievable stillness but then, as my ears tune in to it, a subtle soundtrack, The sound of my skis sliding over the powder. Huge sugary crystals, some a centimetre across, issue a barely audible tinkling sound as they jostle for a new resting place. A tinkling like the sound of broken shards from a, too thin, cheap glass as it´s swept up and deposited in the bin. Then, every so often, a soft thwump as a slab, sometimes two or three meters in diameter, suddenly shifts, dropping down a couple of centimetres under my weight. These things are all new. There´s much I don´t understand about this environment. Much still to learn. In the meantime I´ve been hopscotching from goal to goal. You know the process, just a few meters more, just to the top of that rise and then I´ll turn back, but instead, when you get to that rise, the next point of interest comes into view and dares you to carry on. My hopscotching has brought me right to the foot of the last steep pitch and within throwing distance of the summit cairn. I figure it would be rude not to. Willem-Maarten and Theo are starting down but, seeing me on the approach, halt their progress. A few minutes later I´m crossing a field of wind hardened snow, steel edges proving their worth for the first time this weekend, and then I´m at the summit in company. Light is failing fast and though there´s no time to to enjoy the view we do so anyway. Finally, motivated by a cold, cutting wind, we make our way back down. The others, faster as always, let their skis run and put ground between us. I, cautious as ever, take my time on the steeper ground but am happy to be once again alone in the landscape. If the afternoons decision to break trail had been the turning point. This evenings up and down to Storhaugen has been the high point. Lovely photos with lovely views; and some wise words. You really had great luck with the weather! Makes me want to get a pair of skis. Looking forward to the finish. Brilliant Dave, brilliant photos and writing. Those ski gods are bastards! I've learned the hard way. Never show fear! You WILL get down this sheer cliff face alive! Excellent pics by the way, you've captured the subtle colours in the sky perfectly. Wonderful write-up Dave. It was wonderful just staring at those photos - and the story made it perfect. Dave, I thoroughly enjoyed my armchair ski trip. Wonderful writing style and great photos. Just need to go and get a hot drink now to warm myself up! Dave a wonderful report I can relate to the experiences of returning to the vertical after laying the snow. Mine were usually caused by low flying gum trees in the Snowy Mountains in Australia, the weight of the pack sure ensured a rapid face plant once balance was lost. 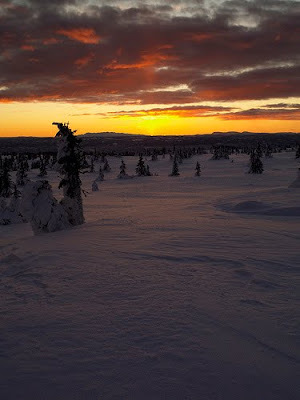 Wonderful photos from a wonderful area, I will always happily get on a plane to visit this area of Norway. Hendrik, Can't believe how lucky we were with the weather. Spent the weeks leading up to departure watching the winter unfold. -15 seemed so much milder after mentaly preparing for -25. Joe, Rare an beautiful indeed. Just sorry I didn't take a photo. Mac E, You'll get your chance I'm sure. Alan, Your latest outing sounds uncannily similar to my typical Dutch outdoor experience. It's an aquired taste but one you get used to in time. Like Bleaklow only lower down. Paul, Welcome. Don't drink too much or you'll have to leave your tent in the night. Roger, Austrailia isn't a place I'd normaly associate with Skiing. Trying to picture flying gum trees. Great post with great pics. It's this type of lovely reads that keep me going through my working days. Karl, Thanks. Glad you enjoy the posts. You can relax, I was on the flat. Almost all of the time in fact. 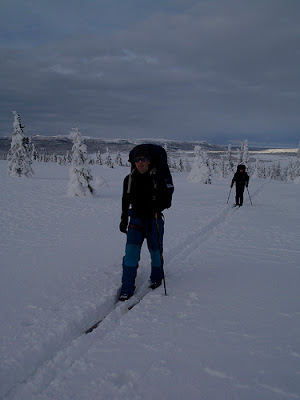 Once you're out of the valley and onto Oyer Fjell the terrain is very gentle indeed, as you can see from the photos. With the possible exception of the last pitches to the two tops we climbed nowhere was the slope in the 25-45° interval. Virtualy nowhere was it steep enough to ski. Wonderful. What a superb way to travel the outdoors and the photos are just stunning. Thanks Martin. Feet, skis, snowshoes, canoes, its all the same to me, just vehicles to get me out into those special places. 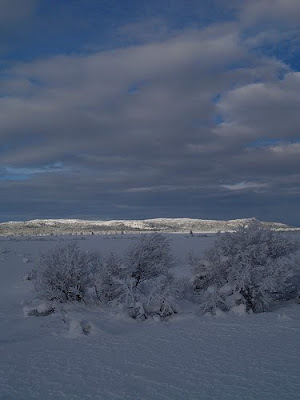 Must confess though, winter landscapes are extra special.